Winter may be a time when your pool is being used less, but that doesn’t mean that you should let your pool’s chemistry go to pot. Regardless of how seldom your pool is being used, pool owners need to get out there at least once a week to test their pool’s water chemistry. Fail to do so and you risk having your pH levels get to high, which can negatively impact the effectiveness of your pool’s chlorine. The result: nasty bacteria and algae build up which can cost you a ton of time and money to clean up. TIP: Adding some chemicals to your pool at certain times during the day can decrease their effectiveness. As a general rule, add chemicals to your pool waters at the end of the day or at a cool point during the day to maximize their effectiveness. A small tear in the liner. A hairline crack in the gunite. W hat’s the big deal, right? What may seem like a tiny and inconsequential problem can actually have a huge negative impact on your pool. Not only can these problems turn into extremely expensive problems for you to solve, but they can also quickly become safety hazards. Whenever a minor repair arises, make sure you fix them ASAP to maintain the health and safety of your pool and of your family and friends. Particularly during the off season, many pool owners will neglect to properly monitor the pool’s water levels. While this may not seem like an issue when no one’s using the pool, pool owners must understand that water levels are what allow for the pump and skimmers to operate at their optimal levels. For over 20 years, Elite Pools & Spas have been providing new pool construction, pool remodels, pool repair and weekly maintenance services for Houston, League City, Pearland, Clear Lake & surrounding areas. Elite Pools & Spas of Houston can work with almost any budget and give you a personalized vision of your very own backyard paradise. Whether you need new pool construction or remodeling services, Elite Pools provides the same quality and attention to detail to all of their projects. As a Hayward Warranty Station, they offer energy efficient pool products for your pool & spa. For more Houston Pools and Spa updates subscribe to their blog and YouTube Channel or ‘Like’ them on Facebook. You can also check their client testimonials to learn more about the exceptional services they provide. Ready to get started on your own backyard oasis? 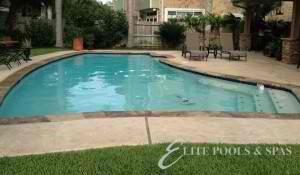 Contact the Houston pool builder experts at Elite Pools and Spas today! ©2017 Elite Pools & Spas. Please call (281) 338-0410 or complete the form below and we will be in contact shortly.